The Catholic University of America School of Nursing (SON) has long partnered with the Veterans Administration to provide quality care, important nursing research initiatives, and clinical partnerships that benefit active duty military, veterans, and their families. 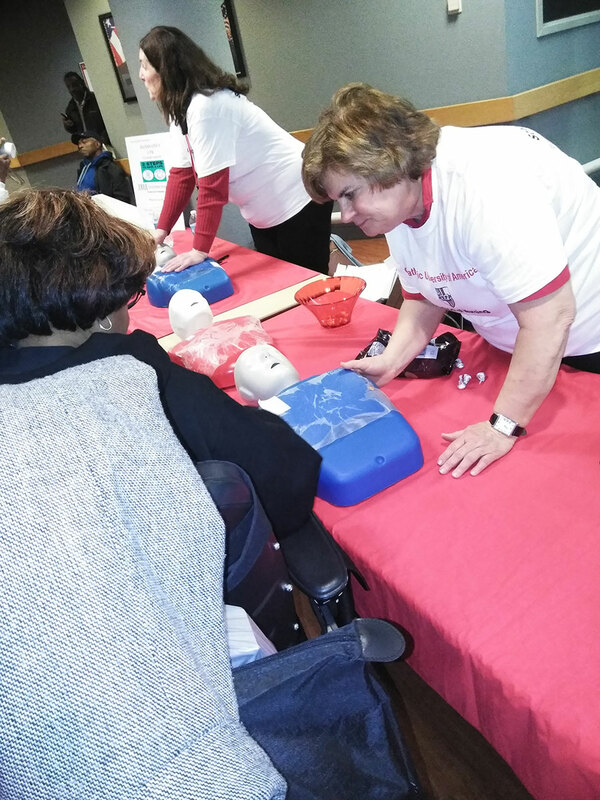 Through collaboration between the Washington DC Veterans Affairs Medical Center and the School of Nursing, a “Hands Only CPR” fair was held at the VA Medical Center just before Valentine’s Day to provide veterans and their families life-saving training. According to the American Heart Association, for every 1 minute delay in starting CPR, a victim’s chances of surviving decrease by 10%. Graduate nursing faculty Marye Dorsey Kellermann and Deirdre Carolan Doerflinger taught this critical skill, which requires no breaths, to almost 200 laypersons entering the lobby of the medical center. Hands on instruction followed the American Heart Association’s “Hands Only CPR” Guidelines. Hands Only CPR was introduced in 2017 to encourage non-medical personnel to provide life-saving assistance. Taught to the tune of the Bee Gees’ “Stayin’ Alive,” Kellermann’s easy-to-learn approach was successful in teaching groups of six laypersons at a time. She taught each group in 5 to 10 minute sessions. Manikins were placed on tables to accommodate the physical needs of disabled veterans. Wearing Catholic University School of Nursing “Leading with our Hearts” T-shirts, Kellermann and Doerflinger sang multiple renditions of “Stayin’ Alive” to help participants master the correct cadence of chest compressions. “It was one of the most rewarding teaching sessions I have ever done,” Kellermann said. “To watch veterans do compressions, and see the look on their faces when they realized they could perhaps save a person’s life with this simple, no breath approach to CPR, was unbelievable!” Carolan Doerflinger added. The Catholic University of America School of Nursing continues to “lead with their hearts,” literally. Catholic University has partnered with the VA on adult geriatric nursing through the Veterans Affairs Nursing Academic Partnership (VANAP) Project since 2015. The program consists of two aims: Ongoing education and professional development of the adult-gerontology nurse practitioner (AGNP) students, and development of a post-licensure AGNP residency. Nearly 20 master’s students from Catholic University’s School of Nursing in the AGNP program have participated in clinicals at the VA. Of those students, four have elected to continue on in a residency program. Through this program, the Catholic University School of Nursing is helping to address the health care needs of an increasing number of elderly veterans, as well as the shortage of nurses with advanced degrees. Catholic University nursing faculty who participate in the VANAP project have been credentialed without compensation and are active with the VA in various levels. 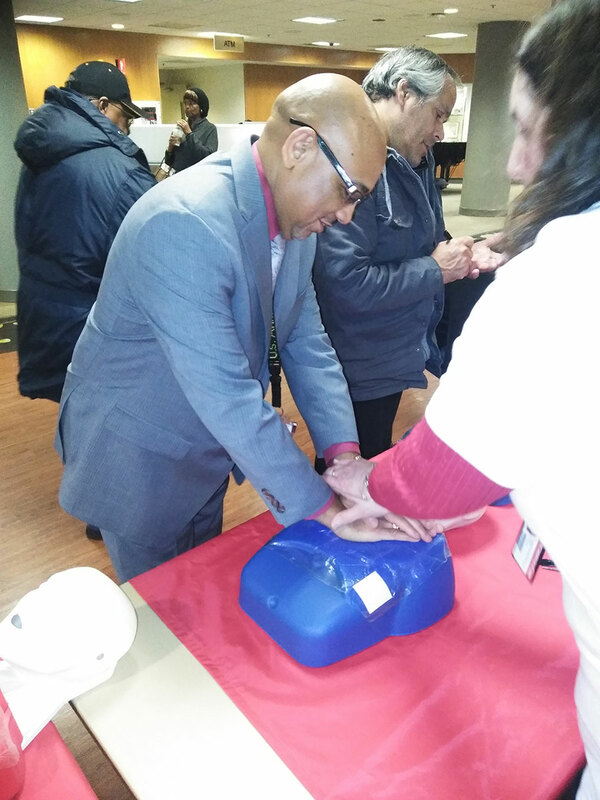 They participate in projects — such as this hands on CPR demonstration — to improve and expand veteran access to care. In addition to the VA partnerships, Dean Patricia McMullen identified ways that nursing school faculty and students are extending their reach beyond campus. “For a number of years we have collaborated with the Montgomery County (Md.) School System, offering nurse practitioner managed primary care centers in elementary, middle, and high schools. Many of these schools have high numbers of uninsured and underinsured students who receive all of their routine care and care for common acute illnesses in their school setting. The SON also works with Miriam’s Kitchen in Washington, D.C., to offer a foot clinic for residents who are homeless or without sufficient health insurance.